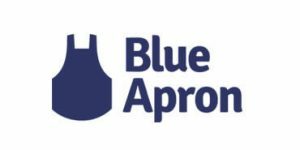 Home - Knowledge Base - What Is Blue Apron? Blue Apron is one of the most popular meal kit services in America. It is designed to make home cooking easier by providing everything you need to prepare delicious dinners during the week, including groceries and original, chef-crafted recipes. 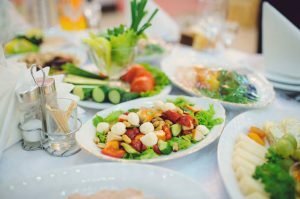 If you are not familiar with the concept of meal kit cooking or just want to learn more about Blue Apron in particular, keep reading this article and get a detailed answer to the common question – What is Blue Apron? First off, let us explain exactly what Blue Apron meal kit delivery can do for you and what we mean when we say that it makes home cooking easier. If you are cooking on your own, you first need to find the recipe that suits your taste, diet, and cravings. Then, you need to go grocery shopping and get all the ingredients. Once you start cooking, you first measure the ingredients and then follow the sometimes vague recipe. Afterward, you need to think of ways to use up all the leftover ingredients before they go to waste. If you are cooking with Blue Apron, you do not have to search for recipes because Blue Apron creates new recipes for you every week and allows you to choose the ones you like the most. You do not have to shop for groceries and measure the ingredients because Blue Apron does the work for you. You do not have to worry about getting the recipe wrong because Blue Apron recipes are designed with beginners in mind and thoroughly explain each step of the process. You do not have to deal with food waste because you get just enough food to prepare the meals, so goodbye slimy kale and mushy tomatoes. You do not have to spend any gas money because the recipes and ingredients are delivered straight to your doorstep. In a word, Blue Apron is a great shortcut to a delicious home-cooked meal. 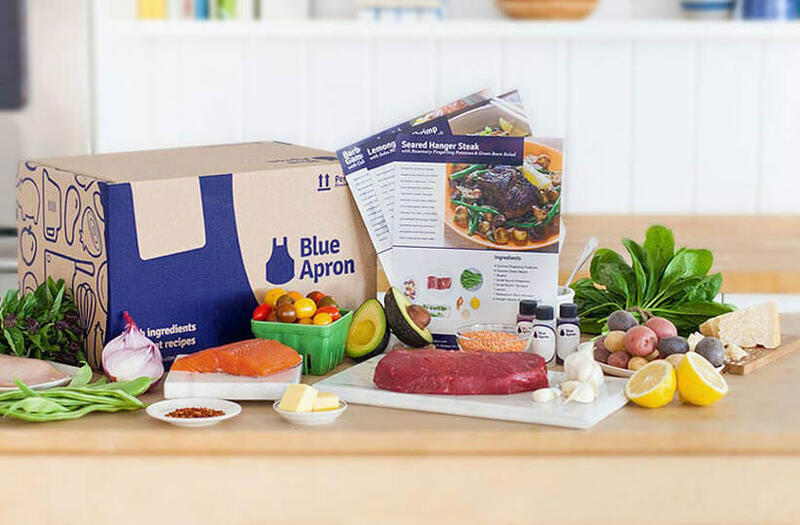 Blue Apron is a subscription-based service. If you want to order food from Blue Apron, you first need to create an account – but don’t worry, you can skip or cancel any time you like. You can choose whether you want to cook for 2 or 4 people. If you cook for 2 people, you can order 2 or 3 recipes per week. With the 4-person option, you can choose 2, 3 or 4 recipes every week. If you are ordering for 2, you have 3 meal plans at your disposal, including the 2-Serving Signature, 2-Serving Vegetarian, and 2-Serving WW Freestyle (Weight Watchers reimagined) plans. The 2-Serving Signature plan lets you choose from 8 new omnivore and vegetarian recipes every week. The 2-Serving Vegetarian plan brings you 3 fresh veggie meal ideas per week. The 2-Serving WW Freestyle plan lets you pick any 2 or 3 of the 6 healthy recipes, complete with SmartPoints if you are following the WW guidelines. If you are cooking for 4 people, you have 1 meal plan available – the 4-Serving Signature plan. With this option, can choose from 5 kid-friendly, omnivore recipes designed for that week. Once you make your choice, Blue Apron handpicks the freshest, highest-quality ingredients and pre-measures them in accordance with the number of servings you have selected. It individually packs all ingredients necessary to prepare the meals (with the exception of pantry staples like salt and flour), places them in an insulated box together with the recipes of your choice, and ships them to your home. When the box reaches your home, you just need to unpack everything, follow the recipe, and create delicious meals in just around 30-40 minutes. If you thought that this kind of convenience costs a fortune, we are happy to say that this is not the case. If you are ordering for 2, you pay $9.99 per serving. If you are ordering for 4, you pay $8.99 per serving if you order 2 recipes per week, $7.99 if you order 3 recipes per week, and $7.49 if you order 4 recipes per week. Shipping is free unless you order 2 recipes for 2 people, in which case you pay a $7.99 shipping fee per delivery. Compared to how much you would spend if you were shopping for groceries yourself (including gas money and food waste), we can say that this is a rather good deal. Plus, if something is wrong with your shipment (e.g. missing ingredients or damaged products), you can get a replacement, credit or refund, so you never risk wasting money on food that is not perfectly fresh. Blue Apron is a service that allows you to take a break from meal planning and grocery shopping and cook with less effort and in less time. It is convenient, rather affordable, and a perfect home cooking solution for days when you have no more than half an hour to cook a meal. If you are looking for a simpler way to get a great meal on the table, Blue Apron may be just what you need.